Rich, bitter, dark chocolate paired up with dark bergamot flavored Earl Grey is a match made in heaven. You can even add some orange rinds to the cream infusing step to play up the orange essence in the Earl Grey. Serve with any orange infused tea and you will find out what all the hype is about! Place the finely chopped chocolate into a large heat proof bowl. Set aside. In a small saucepan over medium heat, heat the heavy cream and tea leaves to scalding. Turn off heat, cover, and allow to steep for 15 minutes. Return the cream to the heat and bring to scalding once again. Turn off heat. Strain the cream over the chocolate. Set aside for 5 minutes and then whisk until smooth. Whisk the butter into the still warm chocolate mixture until smooth. Refrigerate until the truffle base is firm enough to scoop, at least 2-3 hours. To make truffles: use a small cookie scoop or teaspoon scoop out the chocolate truffle mixture and form into about one inch sized balls. Be sure not to handle the truffles for long amounts of time, the heat from your hands will start to melt the chocolate. 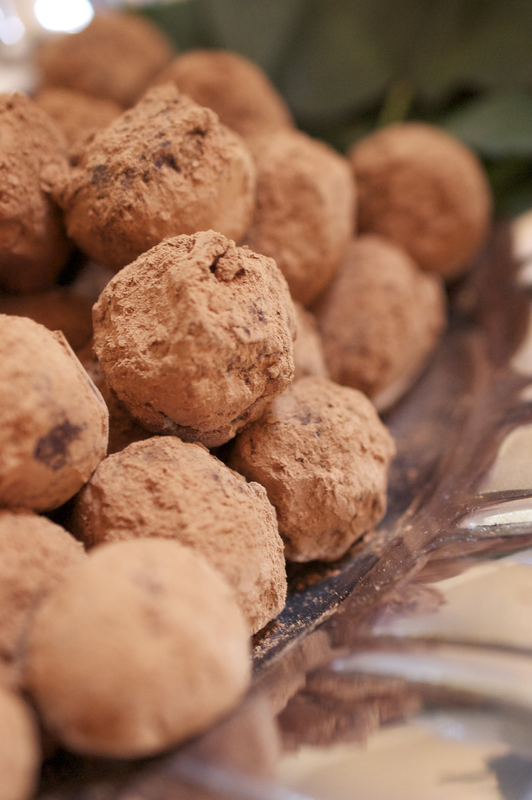 Place the truffle balls into the cocoa powder and cover completely. Dust your hands with cocoa powder to help prevent your hands from becoming sticky. Truffles are served best a room temperature. To store the truffles keep refrigerated in an airtight container for up to 1 month.